i thoroughly enjoyed my first of the art style series, art style: pictobits, and i “finished” playing through another entry recently, art style: aquia. although pictobits made great use of classic 8-bit NES sprites and music, aquia follows the more lumines aesthetic that more of the rest of the series has used. although lumines has influenced a whole generation of puzzle games with its hypnotic techno aesthetic, many of them are forgettable and, frankly, not much fun to play. neither of those could be said about aquia, though. its aesthetic is clean, attractive, and, well, stylish, as is its soundtrack (much of which is generated from the user’s actions). but an equal draw is the gameplay itself, which offers a unique spin on typical match-3 puzzle mechanics to create something thoroughly fresh. for a run-down of the game mechanics, check out the review at nintendolife. i’ve played many a puzzle game by now, and if you’ve read my blog you’ll see that i consider the only real challenger to tetris for the title of greatest puzzle game to be the games in the panel de pon, aka tetris attack, aka puzzle league series, thanks to its deep combo/chain system. aquia proves to be, if not quite a contender, certainly a worthy runner up, because although it does have a combo system, the game is so fast paced that you’ll end up simply focusing on finding matches as quickly as possible. i really haven’t had much interest in puzzle games that don’t require a more cerebral element, but this game is incredibly well designed and its presentation is supremely polished, and its progression of difficulties (horizontal shape to vertical shape to square) and progression of levels using the same shape (a new color gets added every other stage) is so mathematically elegant that the game as a whole is supremely satisfying to play, not to mention wicked addictive. and make no mistake: the game’s mechanics do take some time to master, and randomly moving pieces around will never get you very far. 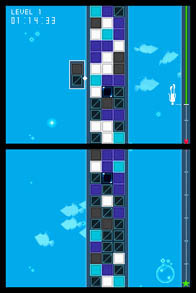 (although i wasted a lot of time making the game harder for myself b/c i didn’t realize for a while that you can rotate the colors in the blocks with a press of a button.) also, in a not atypical nintendo fashion the first of the three shapes, while the easiest to understand, is the hardest to play through. with all this gushing it should come as no surprise that the game has earned a place on my list of greatest games of all time, the first DSiware title to do so and the first game of this year. once i mastered the game’s mechanics i didn’t really feel like playing more would make me a better player (unlike the puzzle league games, which always make me feel like there’s more to master), but the game is so enjoyable to play that i could easily spend more hours just being hypnotized by the gameplay and the soundtrack. in any case, time to download my next art style game and see if anything else in the series comes close to surpassing this one.